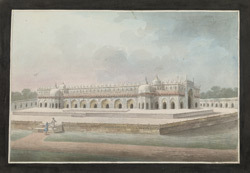 Watercolour of the Great Imambara in Lucknow, by an anonymous artist working in the Calcutta style, part of the Wellesley Collection, c.1798-1804. Nawab Asaf ud-Daula of Awadh (r.1775-1797), requested architect Kifayat-ullah in 1784 to construct the Great Imambara, for the purpose of celebrating the Muslim festival of Muharram in commemoration of the imams Ali, Hasan, and Hussein. Subsequently, the imambara was used as a mausoleum for Asaf ud-Daula upon his death in 1797. Both the interior and exterior of the hall are highly decorated. Illustrated here is the Great Imambara on the left and the Asafi Masjid (built between 1775-97) on the right. Both structures are located within the complex's central court.